Peleus wrestles the Nereid Thetis seeking to capture her as his bride. The pair are surrounded by a company of fleeing Nereids. 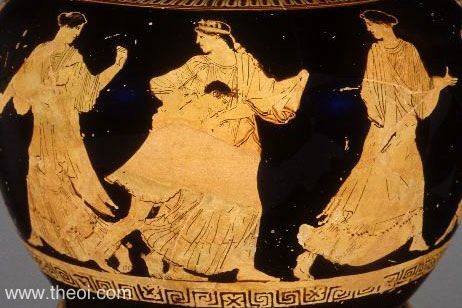 The seven Nereids in the scene are named on the vase--Cymathoe, Cymatolege, Nao, Melite, Psamathe, Speo and Glauce. Nao is the Nereid to the right of Thetis in this image.